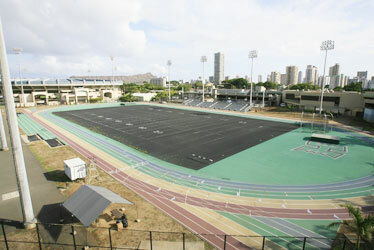 Cooke Field, on the University of Hawaii-Manoa lower campus, has been due for an overhaul of its artificial turf. Cooke Field is used by the Warriors football team, intramural sports, ROTC and track and field. After complaining of unethical behavior related to the bidding process, Logan Hamocon's company Sports Turf Hawaii has won the contract to repair the field. A landscape contractor who alleged that a state board member used his position to eliminate competition for million-dollar synthetic turf contracts has won the contract to repair Cooke Field. The University of Hawaii announced yesterday that Logan Hamocon's company -- Sports Turf Hawaii -- won the bid to replace the synthetic turf at Cooke Field, a practice field for the UH Warriors football team. "I'm obviously happy that we were able to pull off this bid," Hamocon said. "More importantly, I think the challenge was just being able to bid the job. Having that opportunity, that really was my battle from the start." University officials awarded the contract to Hamocon even though he did not have the synthetic turf license recommended by the state Contractors License Board, which oversees contractor licenses. Before the bidding opened last month, David Hafner, UH assistant vice chancellor for campus services, said he was concerned about skirting the board's recommendations because it could lead to a protest, a formal objection that could delay work. But that concern was erased because Hamocon was the low bidder. After the bidding closed, Hafner said Hamocon, who beat three other contractors with the lowest bid at about $863,000, had good recommendations for his synthetic turf work at Les Murakami Stadium. "This is a fully capable low bidder," Hafner said, adding the decision was "in the best interest of the taxpayer." RMY Construction, a general contractor, and Hamocon's company, as subcontractor, bid about $21,500 less than the next bidder, Applied Surfacing Technology. A dispute on the Cooke Field project erupted last month when Hamocon said Denny Sadowski, a member of the Contractors License Board and the listed agent for Applied Surfacing Technology, tried to limit his competition by asking the board to require a special license for synthetic turf jobs. In October the board voted in favor of Sadowski's recommendation that contractors have a special license to install synthetic turf at sports stadiums in Hawaii. The decision reduced the number of contractors that can install synthetic turf at sports stadiums from hundreds to four, one of which was Applied Surfacing Technology. "What it comes down to is, what he's done in his position is wrong," Hamocon said after learning he would win the Cooke Field contract. "The fact is there's definitely a conflict of interest." Sadowski declined to comment for this story. The board started tackling the issue in July 2007 when a contractor asked the board whether landscape contractors needed a special license to lay synthetic turf, said board executive officer Verna Oda. Sadowski, the synthetic turf expert on the board, brought up his special licensing recommendation in August, Oda said. At the October meeting, Sadowski recused himself as the board passed his recommendation. Oda said the board's decision was only an informal guideline and not a rule change. Hamocon, who is a landscape contractor, said he did not know of the board's revised opinion until he began preparing a bid for Cooke Field recently. He worried he was disqualified from the project, despite having laid synthetic turf at Les Murakami Stadium. Mark Carr, who represents the synthetic turf manufacturer Domo Sports Grass, questioned why the board never requested input about synthetic turf work from him or Hamocon, who was working on the largest synthetic turf job in Hawaii at the time -- Murakami Stadium. "If Denny's the expert on this board, then he knew who should have been called in to talk about this," he said. "They never called Logan or me." Oda said four contractors that raised questions at the time were called for comment. "They (Hamocon and Carr) weren't even on the radar at the time," she said. Oda said in an opinion piece written for the Star-Bulletin that the board asked the state to raise the matter with the state Ethics Commission and to advise on any needed changes. The board will vote again on whether contractors need a synthetic turf license at its Aug. 22 meeting. Hafner, with the university, said the Cooke Field project will start in August and end by November.